Thanks to the hard work of local adoption groups, the public has become increasingly familiar with greyhounds and their gentle nature. 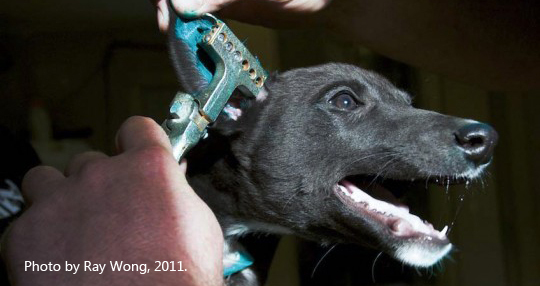 Few of us, however, know what life is like for greyhound puppies in the racing industry. I'm hopeful this will start to change today with the release of a new video, The Secret Life of Greyhound Puppies, which documents the greyhound breeding industry as never before. 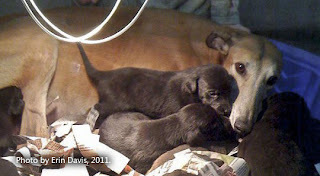 This new video contains photographs that were taken between 2006 and 2012 by local officials, greyhound breeders, and owners, at facilities in Oklahoma, Kansas, Texas and West Virginia. The Secret Life of Greyhound Puppies shows greyhound puppies being tattooed at a few months of age, puppies kept outside with just small buildings for shelter, and breeding dogs enduring lives of confinement. Some of the photographs in this new video were taken by county officials at an Oklahoma greyhound breeding farm owned by Kay Smith, one of the largest greyhound breeders in the country. These Oklahoma photographs are being publicly released today for the first time. 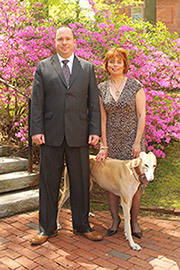 I'm confident that the more people know about commercial greyhound racing, the better things will be for greyhounds. Please watch our new video today, and then share it with others. Together, we can make real changes for these sweet dogs, and move closer to the day when greyhound racing ends completely. Poor little Mummy dogs..so innocent and so abused and misused. Still trying to do the best for their pups. I hate these wretched inhumane people. This is pure torture for these wonderful dogs. hell. They all need to be shut down for good.